The Economy Today is noted for three great strengths: readability, policy orientation, and pedagogy. The accessible writing style engages students and brings some of the excitement of domestic and global economic news into the classroom. Schiller emphasizes how policymakers must choose between government intervention and market reliance to resolve the core issues of what, how, and for whom to produce. This strategic choice is highlighted throughout the full range of micro, macro, and international issues, and every chapter ends with a policy issue that emphasizes the markets vs. government dilemma. The authors teach economics in a relevant context, filling chapters with the real facts and applications of economic life. Schiller is also the only principles text that presents all macro theory in the single consistent context of the AS/AD framework. Interactive Graphs - New interactive graphs within Connect help students see the relevance of the subject matter by providing visual displays of real data for students to manipulate. All graphs are accompanied by assignable assessment questions and feedback to guide students through the experience of learning to read and interpret graphs and data. Connect the Dots Videos - A new video series in Connect provides additional support for the most difficult topics in the principles course. Accessible through SmartBook, the videos provide short, engaging explanations at the moment a student is struggling to help them connect the dots and grasp challenging concepts. Updated Examples and Applications Throughout: Updated to stay relevant in today's world, The Economy Today adds to its already robust foundation of real-world application with new examples that will capture students' attention, including: Wal-Mart’s 2014 price cuts on the Galaxy S4, oil prices in the wake of the Malaysian Airlines downing, bitcoins, the American Taxpayer Relief Act, the Affordable Care Act, the iPhone 6 launch, 2015 tax hikes on cigarettes, Tesla’s new “gigafactory,” and the tablet market. Price determination is illustrated in Chapter 3 with NCAA ticket scalping, price cuts on Galaxy phones, and the surge in shrimp prices following the Gulf BP oil spill. In macro, there are new CBO estimates of the jobs impact of the 2011–2013 defense cuts (Chapter11); the effect of tuition hikes on the inflation rate (Chapter 7); public opinion of the relative importance of the deficit problem (Chapter 12); recent changes in consumer confidence, spending, and wealth effects (Chapter 9); and CBO’s assessment of the causes of the Great Recession of 2008–2009. In micro, the record-breaking Alibaba IPO highlights the role of financial markets in reallocating resources (Chapter 32). Israel’s deployment of its “Iron Dome” missile defense system offers a new illustration of public goods. Among the new World Views in macro are China’s 2014 cut in its reserve requirements (Chapter 14), Venezuela’s increasing socialism (Chapter 37), the U.S. 2014 imposition of tariffs on Chinese solar panels (Chapter 35), Heritage Foundation’s 2015 global rankings on its Index of Economic Freedom (Chapter 1), and the World Bank’s perspective on widening global inequality (Chapter 5). In micro, the oil-market response to the downing of the Malaysian Airlines flight in the Ukraine puts a spotlight on the determinants of demand in Chapter 3. As in earlier editions, the 14th edition forges explicit links between the end-of-chapter problems and the content of the chapter. Problems require students to go back into the body of the text and use data from the In the News and World View boxes, as well as from standard tables and texts. This strategy greatly improves the odds of students actually reading the boxed material and comprehending the graphs and tables." The discussion questions also require students to make use of material within the In the News boxes and the body of the text. Virtually all of the new Discussion Questions build on such in-chapter content." We are pleased to welcome Karen Gebhardt (Colorado State University) to the author team. 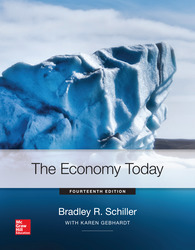 Karen has made important contributions to the 14th edition of The Economy Today as a digital coauthor, including helping create quality digital materials to accompany the textbook and ensuring that the Test Bank and end-of-chapter questions are not only accurate but contain effective and probing questions for students." Market vs. Government: While the debate about markets vs. government has always been a central theme of The Economy Today, the recent economic crisis has brought a resurgence of attention to the basic choice between market reliance and government intervention. In the very first chapter, the concepts of both market failure and government failure are introduced and discussed, and in every subsequent chapter the debate is continued. “The Economy Tomorrow” feature at the end of every chapter challenges students to apply the markets vs. government options to specific policy issues. There is no right or wrong answers. The goal of The Economy Today is instead to expose students to the central debates in economic theory and policy – and challenge them to think about these debates analytically. Policy Emphasis. Schiller motivates students with real-world policy issues to help them become economically literate. The Economy Today contains more real-world applications than most Principles texts, and uses economic policy to show the student the reality and relevance of economics. The articles and applications are chosen from related publications, such as The Wall Street Journal, USA Today and BusinessWeek, to help students tie concepts to situations in their everyday life. Every chapter starts and ends with policy issues. Again, the authors present issues in a balanced and unbiased manner, exposing both the potential and pitfalls of any policy decisions. One-Model Macro: Schiller is the only text on the market that presents the full range of macro theories in the AS/AD framework. His unique depiction of Keynesian theory - including the multiplier - in the AS/AD framework eliminates the need to teach both the Keynesian Cross (which ends in an inflation dead-end) and the AS/AD framework. This unique, single-model approach streamlines and simplifies the macro course, with no loss of macro theory. No other text does this, making this the most distinctive feature of Schiller's macro. Instructors who have tried it, love it. Treatment of Aggregate Demand/Keynesian Cross: Schiller examines Keynesian theory entirely within the AS/AD framework by moving the Keynesian Cross to an appendix. This appendix includes a model of the Aggregate Expenditure Curve. This allows instructors to streamline and simplify the macro discussion without any loss of theoretical rigor or coverage. This way, instructors who teach the Keynesian cross can examine it in a separate discussion, and instructors who do not can easily skip over it without any interruption in the text progression. Schiller News Flashes: As up-to-date as The Economy Today is, it can’t foretell the future. As the future unfolds, however, author Brad Schiller writes 2-page “News Flashes” describing major current economic events and relating them to text concepts. “News Flashes” are sent to adopters 4-6 times/year, and are a great source for lecture material, and can be copied for student use. Chapter on Global Poverty: Brad Schiller is a leading authority in Global Poverty and brings it to the principles course with this complete chapter. An array of global data, theory and policy combine to make an engaging and eye-opening study of this world-wide issue. While it is placed at the end of the book, it can be used at any point during the course and serves as a great launching pad to engage students on application of key economics issues. Assurance of Learning Ready: Many educational institutions today are focused on the notion of assurance of learning, an important element of some accreditation standards. The Economy Today,13e is designed specifically to support your assurance of learning initiatives with a simple, yet powerful, solution. Each test bank question for The Economy Today, 13e maps to a specific chapter learning outcome/objective listed in the text. You can use our test bank software, EZ Test Online, or Connect® Economics to easily query for learning outcomes/objectives that directly relate to the learning objectives for your course.You can then use the reporting features of EZ Test to aggregate student results in similar fashion, making the collection and presentation of assurance of learning data simple and easy. Karen Gebhardt is a faculty member in the Department of Economics at Colorado State University (CSU). Dr. Gebhardt has a passion for teaching economics. She regularly instructs large introductory courses in macro and microeconomics, small honors sections of these core principles courses, and upper division courses in Public Finance, Microeconomics, and International Trade, as well as a graduate course in teaching methods. She is an early adopter of technology in the classroom and advocates strongly for it because she sees the difference it makes in student engagement and learning. Dr. Gebhardt has taught online consistently since 2005 and coordinates the online program within the Department of Economics at CSU. She also supervises and mentors the department’s graduate teaching assistants and adjunct instructors. Dr. Gebhardt was the recipient of the Water Pik Excellence in Education Award in 2006 and was awarded the CSU Best Teacher Award in 2015. Dr. Gebhardt’s research interests, publications, and presentations involve the economics of human–wildlife interaction, economics education, and the economics of gender in the United States economy. Before joining CSU, she worked as an Economist at the United States Department of Agriculture/Animal and Plant Health Inspection Service/Wildlife Services/National Wildlife Research Center conducting research on the interactions of humans and wildlife, such as the economic effects of vampire bat-transmitted rabies in Mexico; the potential economic damage from the introduction of invasive species to the Islands of Hawaii; bioeconomic modeling of the impacts of wildlife-transmitted disease; and others. In her free time, Dr. Gebhardt enjoys learning about new teaching methods that integrate technology, as well as rock climbing and camping in the Colorado Rockies and beyond.